Wood pellets are compressed sawdust (most often waste by-product from the wood products industry) that has been processed and bagged to be used in a Pellet stove. There is no glue or binder used to hold the pellets together. Wood Pellets are about as thick around as a pencil and come broken into small pieces of generally less than 1″ in length. Standard Grade Wood Pellets may be made out of a lower quality (yet less expensive) wood fuel-stock that might contain things like bark. The end result is Wood Pellets will produce a greater amount of ash (1% to 3%). This can sometimes be a more economical choice. Premium Grade Wood Pellets are made out of higher quality wood fuel-stock that does not contain any bark. The end result is Wood Pellets will produce a lesser amount of ash (up to 1%). Which Grade should you use? If price is no object, you should always go with Premium Grade Wood Pellets. They produce less ash, which means that you are getting more combustable fuel per pound, and you have to load your Wood Pellet hopper and empty out your ash bin less frequently. More importantly, some Pellet Stoves do not have the ability to handle various grades of Wood Pellet, so you have to use Premium Grade. However, if price is a concern, and your stove can handle various grades of Wood Pellets, you may want to consider Standard Grade Wood Pellets. Just figure out the price difference. If you can save more than 3% by going with a standard grade of Wood Pellets, you’ll save a little money by going with the less expensive fuel. Pellets are generally identified as softwood (e.g., pine) and hardwood (e.g., oak). People always think that hardwood is preferable, but if your stove can burn softwood, it may be preferable. One pound of pellets is a pound of pellets. By the time the sawdust makes it into a pellet, the hardwood is not any more dense. The softwoods actually contain more heat per pound. 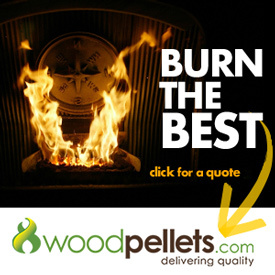 As long as you can control your stove for various types of pellets, you would do well to consider softwood pellets.